Google came up with Nexus, which according to them was the best Android Experience on a smartphone. Essentially, for all those of you who don’t know what a Nexus device is all about, they are a line up of devices that run pure stock Android or Vanilla Android as some to refer them. For the purpose of better understanding, simply consider a phone from Samsung. All the Android phone that Samsung launches, comes with a version of Android with a custom UI laid on top of it. Samsung calls it the Touch Wiz, while some other manufacturer does the exact same thing with few visual differences and gives it a name. While these smartphones are still running a version of Android indeed, but it takes away from the pure stock experience. An experience which Google intended to deliver. And obviously, in order to deliver that experience, Google teams up different OEMs to build hardware for the pure stock Android to go with it. And that is how we got to experience all these different Nexus devices like the Nexus One, Nexus S, Galaxy Nexus, so on and so forth till the Nexus 5X & 6P that were launched last year. This year, however, things aren’t exactly the same. In fact, this year pretty much marks the end of Nexus line up of smartphones meaning the company will not be releasing any other smartphone with the Nexus brand or at least they don’t have any plans as of now. So what happens now? What happens to the Ultimate Android Experience and all that melodrama? Well, Google has an answer for that, and it is the Pixel. Yes, Meet Pixel, a Phone by Google. Now if you put a little strain on your brain go back in time, you may come across something called the Chromebook Pixel. Let’s just say; it is where it all began. After that, we saw the Pixel C tablet, and now here we are, talking about a smartphone named the Pixel. While all this makes a lot of sense, but the one question which remains unanswered is why Google decided to put an end to the Nexus brand in favor Pixel? For most people, this won’t be that big of a deal at all since it’s just a name change. But it is not just a name change. Google is completely dropping everything that they stood for all these years. [quote align=’left’] The whole idea behind Nexus was to offer a quality experience at an affordable price. [/quote]The whole idea behind Nexus was to offer a quality experience at an affordable price. Now the with Pixel they are trying to deliver something a lot more than just that. Anyway, let’s keep this discussion aside and focus more on the star of the show here. This year just like last year, we get two phones. One is simply the Pixel, and the other one is the comparatively bigger variant called the Pixel XL. And just like the Nexus devices, these two smartphones will be running stock Android out of the box. And they also come with the same Google Support for software promising the fastest software updates. And that is very obvious, right? These smartphones come with an experience made by Google after all. Anyway moving on, for the sake of understanding, I will be referring this smartphone as Pixel only unless required otherwise. Everything that I talk about in this review holds for both Pixel and the Pixel XL except for few places where it will be clearly mentioned. One of the most talked about, and polarizing aspect of the Pixel is its design. Especially at the back, the glass pane which is supposed to have a Gorilla Glass coating is what makes it stand out. Not sure if it’s a good addition or otherwise, but it is there and it will grow on you over time. And it turns out that it is not there just for looks. It is intended to help with cell reception along with Wifi & Bluetooth signals. So if you hate it, then you don’t have a lot of options other than putting a case or skin of some kind on top of it. But do make a note that it can crack/shatter easily, so it is suggested that you take good care of it or handle it with care if you have sloppy hands. Our unit got a hairline crack towards the bottom of the Fingerprint scanner, but it should not be an issue since it never looked good without it anyway. 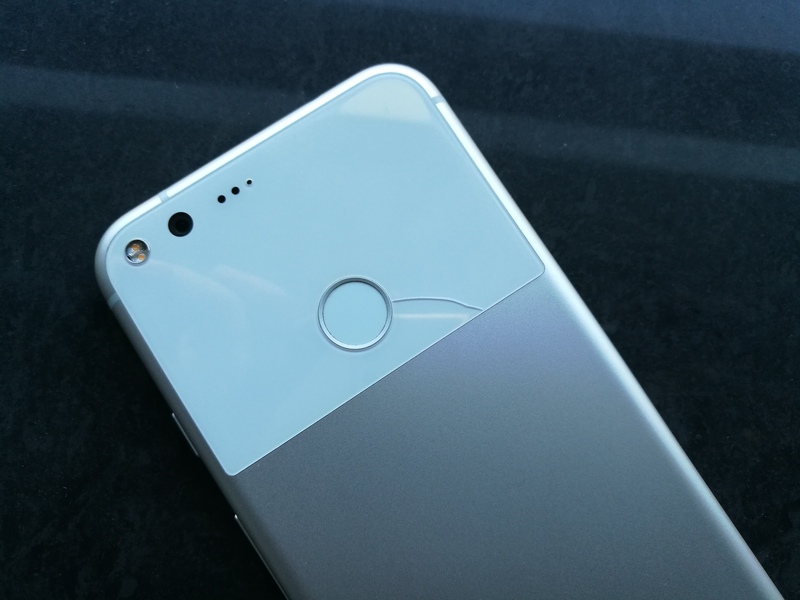 And talking about the fingerprint scanner dubbed as the ‘Pixel Imprint,’ apart from unlocking the phone, which it does great by the way, you can also use it to pull down the notification shade. This is probably the best place to have the fingerprint scanner. Yes, when it is resting on a table, it might not be very helpful, but when you pull it out of the pocket, you can just have it ready to go. Another thing which most of the people hate about this phone is its thickness. The Pixel is 8.6mm thick at its thickest point while the iPhone 7 for reference is only 7.1mm thick. This is definitely not going to be an issue for most people. And yes it is mentioned as the thickest point because the device has a tapered design where the thickness towards the bottom of the device is less and at the top is more. This could be to avoid the camera bump, but you not even notice this at all. Also, the Pixel XL has 3,450 mAh battery while the Pixel has a 2,770 mAh battery. They definitely had to sacrifice on the thickness to fit in the battery of this size. Coming to the front, my only problem with this are the thick bezel both at the top and the bottom of the screen. At the top at least it is forgivable because of the speaker grills, sensors, etc. However, at the bottom, it is just there for no reason that i could think about other than just being there for the sake of symmetry. At least on the iPhones, you have the fingerprint scanner/home button there, but here it is just pointless. At the top of the device, there is a 3.5mm headphone jack, and at the bottom, you have the speaker grills as well as the USB Type-C port for charging and data syncing. On the left side, there is nothing but a single Nano SIM slot, and on the right side, you have the power button as well as the volume rocker. [quote align=’right’]Pixel is not the best-looking phone by any means in comparison to devices like the Xiaomi Mi MIX etc. [/quote]Although the power button has a texture to differentiate it, I accidentally kept hitting the volume rocker instead of the power button Maybe it is just me, but the button placement could have been better. That said, the overall design of the Google Pixel could have been way better than what it currently is. It is not the best-looking phones by any means and easily some other device like the Xiaomi Mi MIX, Samsung Galaxy S7 Edge, etc. take the cake for some of the best-designed phones. But it is also not the worst either, and it will eventually grow on you as you use it for a couple of days. In terms of build quality also it feels nice and comfortable in hand and, the glass at the back does a great job of giving it a nice grip while holding which otherwise could have been a very slippery metal smartphone. The Google Pixel comes with a 5” AMOLED display on the front with an FHD resolution, and the Pixel XL comes with a 5.5” AMOLED display with a QHD resolution. Both the displays are covered by a 2.5D curved glass with Gorilla Glass 4 protection on top of it. The colors look fantastic, and they are really nice and vibrant. The screen also gets really bright enough for outdoor visibility under direct sunlight as well. 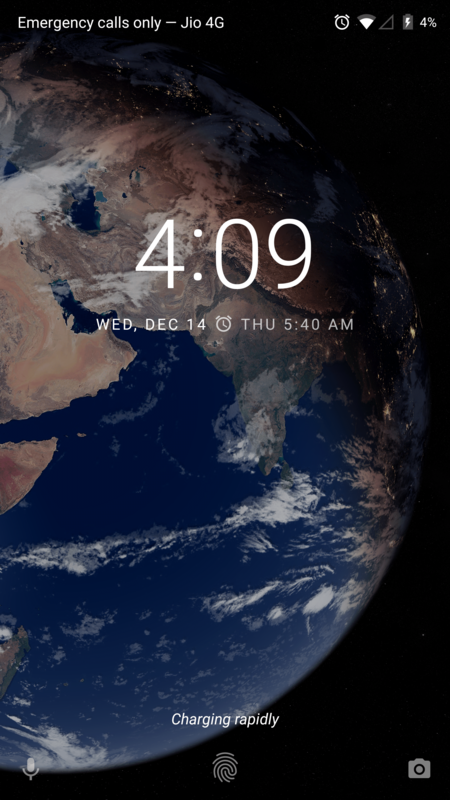 Another feature which i found missing on the Pixel smartphones is the always on display. It does have the ambient display just the one found on some of the Motorola phones. So every time you get a notification, the screen will light up and show you the notifications that came in. It is great, and it works well, but again, it is nothing like having an always on display. Also, the auto brightness seems to be fairly non-responsive. It doesn’t adjust the brightness quickly and everytime you will find yourself pulling down the notification shade and do it manually. It is kind of an annoying factor to have considering you are paying a premium for this device. And if you will get deep into discussing the RGB color gamut and everything, you will find yourself nitpicking issues. But overall, from a consumer standpoint, you should not have any issues whatsoever. Being a flagship smartphone, you can expect the Pixel smartphones to have all the latest and greatest hardware components. So when it comes to performance, this is one area where the Pixel XL does better than any other smartphones out there. For one, it has the Snapdragon 821 chipset and 4GB LPDDR4 memory. Because of this, right out of the box, you get a better performance increase upto 10-percent from the hardware when compared to something like the S7 Edge, etc. After that, there is also the software and hardware optimization which we will talk about later as well. Users will also get a choice of either 32GB or 128GB UFS 2.0 internal storage to choose from. And no, there is not microSD card expansion. So if you thought that it was a thing of past from the Nexus devices, well, it is not here as well. Hence it does look like they borrowed a couple of things from Nexus after all. Another way to think about it is, Google is into cloud storage business as well, and hence they are not going to let you just put in a microSD card and call it a day. There is also a lot to talk about the camera as well and hence let’s just keep that aside for now as well. In terms of connectivity options, Google has a done us a favor and has added all the basics such as 4G LTE, Wi-Fi 802.11ac with 2×2 MIMO, Bluetooth 4.2, A-GPS, and NFC. The device is also bundled with a USB-C connector based on USB 3.1 Gen 1. Inside the box, there is a USB-C to USB-C cable capable of USB 2.0 speeds and a USB-A to USB-C cable capable of USB 3.0 speeds which are a nice touch. And as far as connectivity goes, earlier the Pixel did not support VoLTE for Reliance Jio which has now been fixed with a software update. It now works perfectly fine with all the networks here in India. Oh yes, not to forget the IP53 certification. So they are nowhere near the lines of what the Samsung Galaxy S7 Edge has to offer. The Software running inside the Google Pixel is what makes the smartphone stand out from the crowd. And in the case of the Pixel, the software is not only different from the other Android phones, but it is also different from the Nexus itself. This is a kind of experience which you will only get with the Pixel smartphones. Currently, after a couple of software updates, the Pixel is running on Android 7.1 Nougat with December security patch. As mentioned earlier, even the Nexus smartphones are also running on something close to this; the Pixel has some neat little features which make it simply the best out there. The first and the foremost addition which we will be discussing is the addition of Google Assistant. The Google Assistant is nothing but a virtual assistant just like Siri or Cortana. Back when Google first announced Google Assistant in Google I/O 2016, things were not the same as they are now. [quote align=’left’] The Google Assistant is way better than anything that you have ever experienced. [/quote]The Google Assistant is way better than anything that you have ever experienced. You trigger the assistant the same way you trigger Siri. Tap and hold on the home button which has a really cool animation now by the way. Once you are on the Google Assistant page, all you have to do is, just talk to it. You don’t necessarily have to ask questions. You can also just have a casual conversation and play some games or ask her to sing a song. There are a ton of Siri vs. Google Assistant comparisons out there so; we are not going to discuss anything about that. But right out of the box, the Assistant is really fast and responsive. It only takes her a fraction of a second to understand what you said and do a search and pull you the results. It truly is quite amazing how it works. Back in the days when Google Now and now on tap came in, this is like 100 times better than that. Google Assistant can also understand context based on the last question. This is what give her that conversational ability to talk. But then again, she is not completely perfect as there are a lot of features missing. 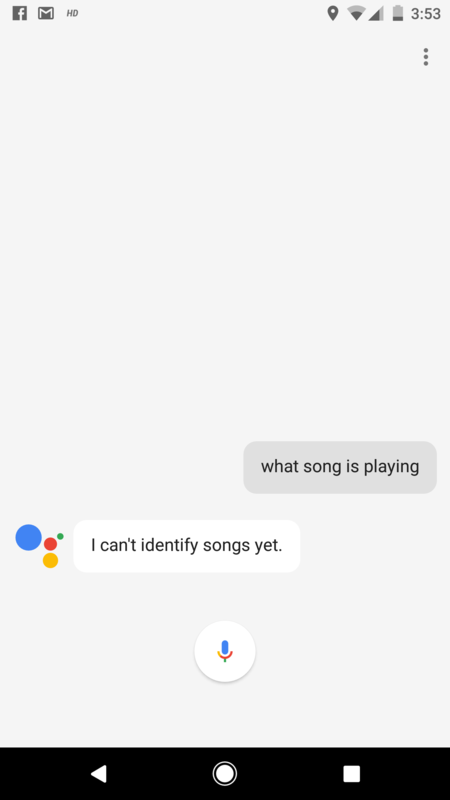 For instance, unlike Siri, Google Assistant can’t identify songs yet. This is a very basic task that even Siri and Google Now can do for you. But the best part is, all the things which she can’t do as of now, she says “can’t do yet,” which means that at least in the future she will be able to do them eventually. This is a huge relief in a way. Other than that, you can ask her to all the basic stuff just like you would do with other assistants. So none of that is going to be an issue. Overall, Google Assistant doesn’t feel like a virtual assistant but feels like she has her own personality, and you will only understand and get to know about it once you start having a conversation with her. As weird as it may sound, it is the truth. And don’t worry, the Now on tap function is still present there. All you have to do is once you invoke assistant, just swipe to see your now-on-tap results. Talking about the other software aspects of the Pixel, the launcher which you see here is also brand new. 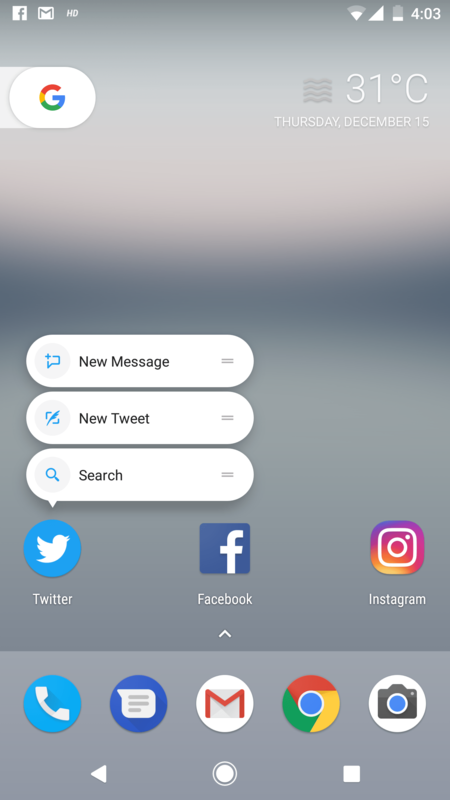 You cannot have it on any other smartphone as of now which means that if you want this kind of a launcher, then you have to get it manually by installing some third party apps, etc. The new launcher has a very neat design. The app drawer now shows up when you swipe up from the bottom, and the launcher also features circular icons for all the in-built apps. But honestly, it is not all that different since most of the apps are yet to implement this. So as of now, only the stock apps will have the circular icon and maybe one or two third party apps may have it. So other than that if you are expecting some kind of a uniform look, then you are not going to have any luck. Another feature which is new are the app shortcuts. Now if you have ever used an iPhone before, you will simply love the addition of this feature here. Once you tap and hold on any icon, these app shortcuts will pop-up. This is very similar to the 3D touch which you do. So maybe if you have 3D touch on any Android phone, it may work like that. Do make a note that this feature is not available on any other Android phone as of now and hence the same can’t be confirmed. But it is seriously a nice addition to have. Other little things like a 24/7 customer support to help you with your issues regarding the device is a nice addition as well. Overall, this is the best iteration of Android that i have personally used till date. The software is extremely refined, there are absolutely no lags or force closes or errors with the software whatsoever. If you are an Android fan boy and can appreciate stock Android, you are surely in for a treat here with the software on the Google Pixel. And this directly takes us to the next topic of discussion which is Performance and day-to-day use. Now that we discussed so much in detail about the software and the hardware, you might already be sold on this smartphone. But let me just go ahead and tell you that it is the best Android smartphone out there in the market. The Hardware internally is great, and although it looks a little out of the ordinary, it will eventually grow on you after a couple of days. And the software is just out of the world. Honestly, before using this smartphone, i was completely bored of Android, and i was thinking of switching to iOS for daily use. But now i that i have used this smartphone and had experience what Google has to offer, i am definitely sold. Google just went all in with this smartphone and had managed t deliver a stunning piece of technology here. All the day-to-day tasks just fly through your eye. It is literally the fastest Android and snappiest Android smartphone out there in the market. Everything is just fast and buttery smooth. There are no lags or stutters whatsoever. The device does get a little warm to touch especially over the long calls or Hotspot usage, but it is nothing to worry about. During your time with this device, you will not notice any type of crashes or freezes or anything like that. It is simply going to be the best Android experience ever. And this is something that we couldn’t say about the Nexus smartphones when they came out. But the Pixel just crushes through and proves to be the best one out there. The slightly bigger display on the Pixel XL could work as an advantage for you if you like to consume a lot of media on your smartphone. But again, yes you will be sacrificing a little on the battery side of things. One thing which Google is very proud about the Pixel is its camera. According to them, it is the highest rated smartphone camera ever. To clear the camera optics, it comes with a 12MP Sony Exmor IMX378 Sensor at the back with a f/2.0 aperture. It has phase, and laser autofocus along with Gyro enabled electronic stabilization. The Dual LED flash also works just fine. Okay, now talking about the camera, there are a lot of things to cover. The Pixel camera, first of all, is supposed to be used in some sort of HDR or Auto processing mode. Looking at exposures, the pixel is trying to produce some bright, vivid and contrasty images. These images will look incredible on the phone’s AMOLED display. But as you keep playing with it, you will start to notice that it is a little brighter than it needs to be. The color saturation is definitely pleasing to the eyes and hence it makes your colors fresh and juicy. Playing with focusing is also surprisingly effective. It produces some different results as you focus on different parts of a subject. The White balance is on point with all the images you take. It neither warm nor to too shabby and overall there is a very happy balance within this finished images. The lack of ability to capture RAW files is a bummer, but it will support that feature via third party apps. Speaking of the camera app, it is a simple Google Camera app. The shutter is on the right and on the left there is swipe gesture to scroll through the available settings. The HDR and flash options can be found on the top. It is a nice maintain view for a no fuss photography. There is not a lot of megapixels to play with here and hence at the maximum zoom, expect a lot of degradation. Macro and Bokeh also works really great, however, trusting the small circle indicator can be cumbersome since it becomes difficult to figure out what is in focus. But thanks to the 1/2.3” sensor, though, it is not particularly difficult at all to blur your background and capture some really awesome shots. However, do make a note that video recording has a different story to say about the focus. It can be a little messy at times when you are constantly moving. But this is 2016, and there has to be something bad to be reported. I mean it is quite difficult there days to ignore some issues right? The Pixel also suffers from a few of those. One such issue is with the lens flaring issue. It is very noticeable and really becomes annoying most of the time. Google said, they will be fixing it with a software update, but we haven’t received one yet and don’t expect it to be fixed as well since lens flaring issue is more of a hardware thing rather than a software issue. But let’s see. On the video side of things as well, things are pretty decent. The problem that i noticed while shooting was with the electronic stabilization. The Google Pixel uses gyro sensor on your phone and tries to stabilize the video. It does a great job, but on the other hand, when move to quickly while recording, the video has this weird stutter. And it is consistent with that issue and it is very annoying. If you want to check out the video quality, go ahead and check out video channel as we did a couple of unboxing videos using the Pixel smartphone like the OnePlus 3T, etc. Overall, the camera on the Pixel XL is pretty good. For users out there who wants a streamlined shooter who doesn’t want to manipulate settings, the Pixel will surely deliver. The only thing you need to do is, point and shoot, like literally. And the results will be stunning regardless. Yes, it does has few issues but still a fun camera to play around with. 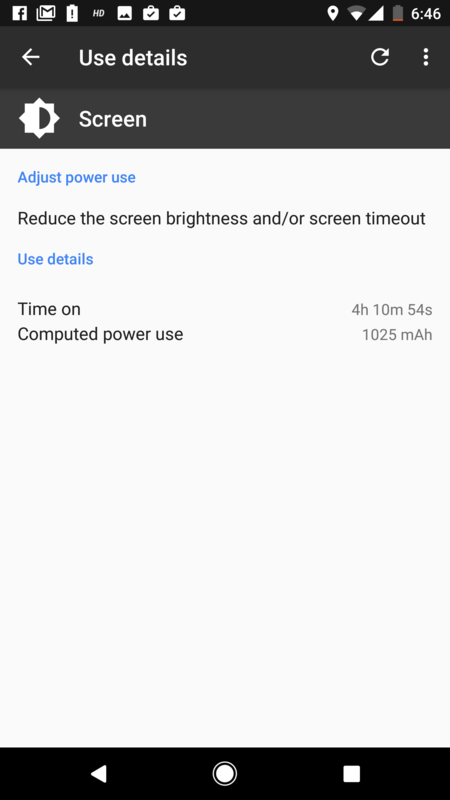 The battery life on the Pixel XL is mediocre. There is not a lot of things to discuss here. 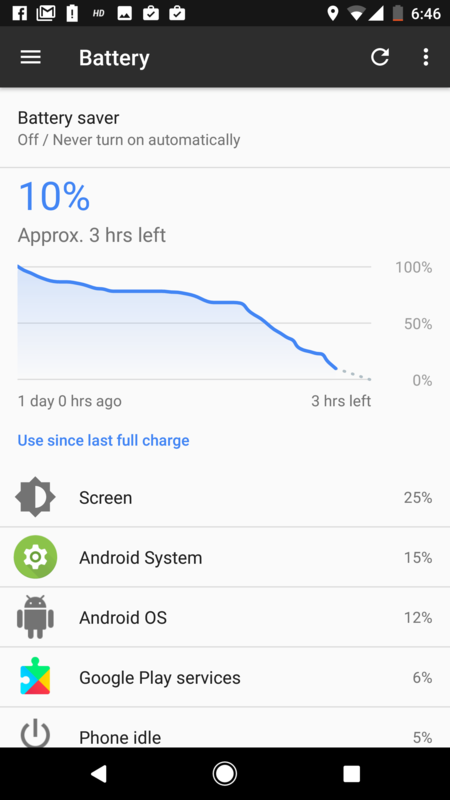 The XL has a 3,450 mAh battery, and with that, it manages to get to about 4 hours of SoT on an average. 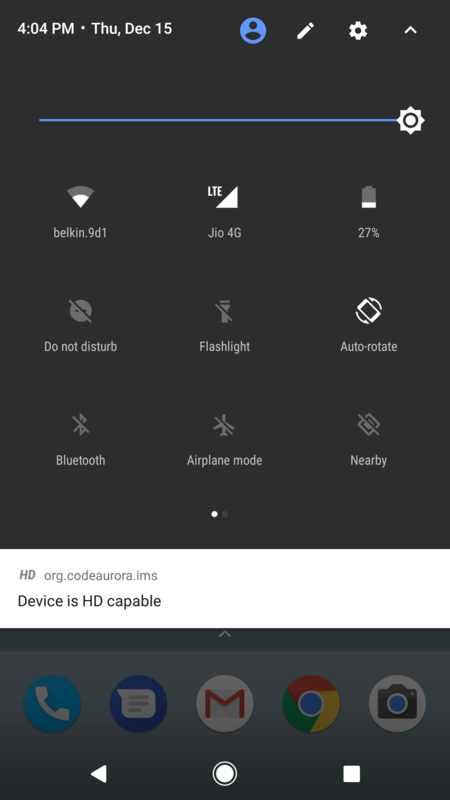 During the usage, it was mostly on Wi-Fi and Reliance Jio 4G otherwise. The charging times are also fairly fast but not comparable to the Dash charge on the OnePlus 3 or 3T. But thankfully you don’t have to charge now and then and hence it becomes a thing which you don’t really need to worry about. The same can’t be held true for the Pixel also since it has a slightly smaller battery and FHD display only. We haven’t had the chance of testing the Pixel and hence can’t comment on that, however, expect it to last for around the same lines. The Google Pixel smartphone is the best Android experience you can get on the market today. Regardless of the smartphones out there running Android, if you want the best mix of hardware with an exceptional software to go with it, this is the one you should buy. The time i had with this smartphone, i encountered no issues whatsoever. The software was on point. It was fast, responsive and overall it was exactly the way i always wanted an Android smartphone to feel. Even on the hardware side of things, i didn’t really have much to complain. It looks fairly decent, and it is also comfortable to hold in hand without being too much slippery. “Unboxed the Beauty, Started the Review, Captured Amazing Photos, Around the End of the Review Phone Slipped & the Glass on the Back Breaks. Turns out it costs a Bomb to get this fixed.” – that pretty much summarizes the experience with Pixel on my end. So the only thing which you need to take care of is the glass at the back which is extremely prone to scratches and shattering/cracking (see what happened to our unit in the adjacent image). Other than that, you should not be having any issues whatsoever. It is premium yet simple to use and very rewarding. You get a very good sense of usefulness out of it and you will mostly feel confident while using one. But, oh yes, there is always a but and in this case, it is the price. The Google Pixel starts from 57,000 INR and the Pixel XL which is featured in this review starts from 67,000 INR. Now this is nowhere near the Nexus pricing. We are talking about a lot of money here. Yes, the price is justified for the most part but still few minor issues like lower IP certification, lens flare issue, etc. makes it a not so appealing package for the price. Few other offerings like the OnePlus 3T, for instance, offers a very near performance for the price. With that said, if you don’t have any budget constraints and are ready to spend around 60,000 to 70,000 INR, then i would say, just hammer the nail and go for this one. It is the best Android smartphone you can buy right now in the market in this price range, and it will be there for a long time to come in the future.